Dry skin can affect just about any area of the body, although when it affects the skin on the face it can really dent confidence. Dry skin is often not only a cosmetic problem- the itching and irritation that it can cause can feel unbearable. Whilst it may feel near impossible to resist the urge to itch, it’s best left alone as it can make the condition worse. Dry skin can be caused by a range of conditions, so if it is particularly severe you should take a trip to your doctor. Applying make-up can also be made to feel like a tedious task, as dry skin can lead to make-up looking flaky and uneven. If you suffer from occasional dry or tight feeling skin, there are some simple steps that you can take to ease and eliminate the problem. Firstly, you need to make sure that you’re drinking enough water, as a dehydrated body can directly lead to dehydrated skin. You should also ensure that your diet includes the recommended 5 portions of fruit and veg a day, as the vitamins and minerals that they provide are essential for healthy skin. 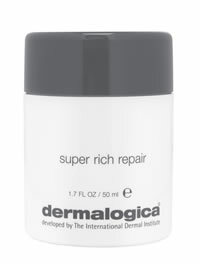 To treat the problem externally, invest in a product which has been specially designed for extra dry skin, such as Dermalogica Super Rich Repair cream. This amazing cream is designed to tackle even the driest and most weathered of skin, and effectively hydrates, improves elasticity and generally eliminates the tight feeling that dry skin creates. So put your faith in Dermalogica and don’t let dry skin control your life.